Led by Buddhist monks, protests sprang up in Rakhine state, as well as other major urban centres such as Mandalay and Yangon, calling on the quasi-civilian government of ex-general Thein Sein, which the military installed, to get tough on Muslims and expel all “Bengalis” to any country, Muslim or Western liberal, that would take them. In fact, in his meeting with António Guterres, the then visiting head of the UN High Commission for Refugees in Naypyidaw in August 2012, President Thein Sein stated “the only solution” to the troubles in Rakhine was either to send unwanted Rohingyas to third countries or to contain them in UNHCR-administered camps.8 The Burmese media outlets including those run by former Burmese political exiles chimed in, echoing the official and popular view that Rohingyas were illegal Bengali migrants with no organic ties to the country. Based on five consecutive years of research, including archival works in Burmese and English, bi-lingual discourse analyses, hundreds of interviews and in-depth conversations we had conducted with the members of the Muslim and Rohingya communities, we argue that the two unfolding parallel phenomena with inter-linkages, namely a sharp rise in fear, loathing and organized violence against Muslims across Myanmar and the official persecution of and mass violence against Rohingyas are in fact on a continuum of racism – strategic choices made by both the country’s most powerful military and the democratically elected NLD government of Aung San Suu Kyi. Those who approach and frame several large-scale bouts of violence in Rakhine since 2012 and the violence against Muslim communities across the country as “sectarian” between the country’s Buddhists and Muslims, overlook something factual and crucial. Both phenomena predate, by several decades, the country’s “democratic transition” which began in 2011. We argue in this essay, that it is not the process of opening up which has catalysed simmering and latent religious and communal tensions to boil over: the violence is a direct outcome of the central, military-controlled state playing the race and faith card for its own evolving strategic ends (for instance, to retain the military’s paramount role in national politics, calibrate the scape and pace of the country’s reforms, thwart the growth of universal human rights as a unifying organizing civic discourse and so on) in a country rich in religious and ethnic diversity with a strife-torn past. In order to better understand how the well-documented popular anti-Muslim fear among the majority non-Muslim public has been mobilised and how the systematic persecution of Rohingyas in Western Myanmar is enabled, it is helpful to take a glance back at the past. Myanmar’s pre-colonial expansionist kingdom of Buddhist Burmese from the Dry Zone plains centred around Pagan, Ava, Amarapura, Mingun, Saggaing and Mandalay. Upcountry Myanmar took the Western coastal kingdom of Buddhist Rakhine as its latest colonial possession through a bloody military campaign in 1785. Consequently, hundreds of thousands of Rakhine war refugees, both Muslim and Buddhist subjects of the fallen Rakhine Buddhist kingdom, fled into the British protectorate of East Bengal (East Pakistan after Indian-Pakistan partition in 1947 and renamed Bangladesh in 1971, after the War of Independence). It was this new interface between the Burmese-controlled new territories – Rakhine – and East Bengal westward of Rakhine that finally led to the first Anglo-Burmese War in 1824. After two more successive conflicts between the two empire-building powers, the Burmese met the same eventual fate as their previously conquered people to the West – Rakhine: the Burmese Empire collapsed and was swallowed up into British India by 1886. Through Burmese eyes, the threat and advent of the colonial British was not simply seen as an economically-defined imperialist attempt to conquer a new territory and its constitutive population and natural resources (for instance, teak, minerals and precious stones). In his Royal Declaration of War against Britain, the last King, Thibaw, openly framed Britishers as anti-Dhamma Kala (or alien heretics) whose victory would be a menace to Buddhism.10 As the king, he was, by the chief Patron-Protector of Buddhism. This nationalist concern became more acute as the result of the worldwide Great Depression which caused widespread economic hardships. There was a sharp rise in popular Burmese sentiments of fear and resentment towards other colonized peoples of Indo-Aryan features, be they Muslims or Hindu, or any other religious affiliation. Since the publication of this report, both the alien rulers and the large number of people of Indian origin had long “gone home”. The Union Jack came down in January 1948, and the country saw two large exoduses –the first on the eve of Japanese invasion in 1942 and the second after the crippling economic nationalization by the Burmese military in 1964. The majority of these Indians had indeed made Buddhist Burma their sole home and had come to love their adopted country. Myanmar’s population of people of Indian subcontinent origin of Islamic background today is only 2.3% of the overwhelming Buddhist majority.15 The country’s politics and economy are under the tight control of Burmese Buddhists, civilian and military – not Indians of any faith. After the last sectarian riots of the 1930’s, the popular fear of the “Indian Peril” was replaced by the pressing need to focus on gaining independence from the British colonial administration which returned to Rangoon after the 3-year interregnum of the Japanese Occupation during WWII. The Burmese political class – now led by the Marxist-inspired nationalists, most prominently of Aung San, with their strictly secularist, non-racialist, inclusive view of “Burmese-ness” – steered public discourse away from the pre-war racialist sentiment.16 Within a year of independence, as the country plunged into a 3-way civil war – Burmese communists, non-Burmese ethnic minorities and the first ethnically Burmese-controlled government in Rangoon – the old fear and loathing of Indians faded into the background for the time being. A crucial point here is this: while choosing to make sure anti-Chinese sentiments do not boil over – because the giant next door, China, is too powerful to anger and because Beijing has served as the “protector” of the Myanmar military regime when it was treated as an international pariah. State and non-state actors have instead reworked – in their official and popular discourses – the old fear of “the Indian Peril” in order to make it applicable in the contemporary context. Two significant developments came about during the two eras of military rule (1962-88- and 1988–2011), namely Islamaphobia resulting from global perceptions of the rise of Muslim power and the state-manufactured perspective of Rohingyas as illegal and/or unwelcome “Bengali” immigrants who do not belong in Buddhist Rakhine land of Western Coastal Myanmar. The military coup of 1962 launched under the leadership of Ne Win as Chair of the newly formed Revolutionary Council, was met with the protests from political monks and campus activists, which had become political allies in their opposition against military authoritarianism. As such, military leaders and strategists identified political monks, students and other segments of society as ‘above-ground threats to building a new socialist order, with the generals as its revolutionary managers’. Indeed, the traditional alliance of monk-student-opposition-dissidents, behind Aung San Suu Kyi as the rallying figure, remained a threat which they sought to neutralise until very recently. Military leaders reached the institutionalized conclusion22 that civilian politicians and liberal democracy were ill-suited and insufficiently strong to bind the multi-ethnic society in which ethnic populations made up an estimated 30-40% of the total population, and were aware of the need for an umbrella ideology to justify their grip on power. The generals have tried hoisting different ideological banners over the years including “the Burmese Way to Socialism”, “restoration of law and order”, later “peace and development” and more recently “discipline-flourishing democracy”. By the early 1990’s following the rise of the human rights, pro-democracy opposition movement, the senior most Burmese military leadership – in fact, Senior General Saw Maung, head of the ruling junta himself – had actively pursued the manufacturing and propagation of anti-Muslim racism through the government’s Department of Religious Affairs, as documented by Reuters’ journalists in their Pulitzer-winner series of investigative articles. Before the advent of Facebook and other social media sites, the fear-mongering narrative relating to Muslims – such as Muslim men as rapists, abusers of Buddhist women, economic exploiters of poor Burmese public – was disseminated through short-monographs and carefully planted moles among Buddhist monks, as well as through classic “whisper campaigns”27. Twenty years after the deaths, under house arrest, of the Muslim Cleanser of the Armed Forces and the Initiator of this anti-Muslim propaganda campaign, ex-general Ne Win and his hand-picked successor Senior General Saw Maung, their legacy that repackaged the colonial-era “Indian Peril” – this time as Muslim Peril – has taken root in the popular consciousness. The call for the liquidation of Myanmar’s Muslims was made openly by Rev. Wirathu, a young, charismatic monk who hails from the Buddhist heartland of Mandalay where he declared, as early as 200128, to rousing cheers of his fellow Buddhist monks his intention to “boycott, ostracize and eventually starve the Muslims of Myanmar”. This was ten years before the country’s military-led “transition”. In other words, the spread of anti-Muslim popular hate speech was already in wide circulation long before the military’s media reforms and the arrival of Free Speech and the social media on Burmese soil. Today the everyday activities of Myanmar’s Muslims from Rakhine State to Mandalay have been branded as threats to national security, resulting in state-intrusion in many aspects of Muslims’ lives, causing varying degrees of symbolic and physical harm. Food donations to Muslims – both in humanitarian and religious/cultural contexts – now come under the purview of Myanmar’s security forces. In the latter part of the Muslim Holy Month of Ramadan this year, Myanmar authorities in the central administrative office of the second largest division – named Mandalay Division – issued a general directive, ordering its township and ward administrative branches, including Myanmar Police Force units, to ensure that international philanthropic and humanitarian groups do not distribute any in-kind or food donations intended for consumption during the fasting month to Muslim communities under their local jurisdictions without prior official permit. Even those with official permits should donate under close supervision by state authorities.37 The implied message and the involvement of Myanmar security forces – police in this case – is that food stuff and other consumer goods for household use donated by groups outside Myanmar are a national security concern. What is little known beyond the well-publicized periodic waves of violence, both vertical (state-directed acts of violence) and horizontal (locally organized communal violence), against Rohingyas as members of an ethno-religious group, is the demographic engineering in which the military governments have been engaged over decades since the Operation Crow (Kyi Gan Sit Hsin Yay) of 1966.48 The military have two major demographic concerns: first, to double the country’s total population up to 100 million because of the country’s geographic position sandwiched between India and China,49 and being adjacent to densely populated Bangladesh and second, to radically (read unnaturally) change the Muslim (Rohingya, ethnically) character of Northern Rakhine State.50 In pursuit of the twin-goal, the military have done three things: 1) they have turned a blind eye to the fact that ethnic Han Chinese from the neighbouring Yunnan state of Southern China have entered and settled throughout upper regions of Myanmar; 2) they have subjected the population to a “campaign of terror” under the disguise of “immigration checks”, centrally directed from the Ministry of Defence the direct result of which are the drastic reduction of the size of Rohingyas from Rakhine as hundreds of thousands periodically flee Western Myanmar for Bangladesh and other 3rd countries, and the instant illegalising of the great majority who choose to remain inside Myanmar; and 3) establishing Buddhist settlements where the military and local authorities implement the scheme of state-directed transmigration of Buddhists51, that is, the government facilitate the West-Bank-style resettlements on the Rohingya region, transporting and resettling different Buddhist populations made up of retired Myanmar civil servant families, Myanmar criminal convicts with Buddhist background from Rangoon and other regions, Bangladeshi-born Buddhist Rakhines and other Myanmar-related ethnic groups whose ancestors were either the 18th century war refugees who fled to East Bengal, or those who were natives of pre-colonial East Bengal when the two adjacent regions of East Bengal and Western Burma were conjoined under the rule of a single monarch. Obviously, to increase Myanmar’s population (of non-Muslims) was a strategic goal of the military leaders as early as 1990’s. Several years ago Myanmar government of ex-general Thein Sein granted blanket citizenship status to about 80,000 Han Chinese living in Eastern Shan state pocket near Yunnan Chinese borders. It even created for the group a new ethnic category – “Mon Yaung Myanmar”, and announcing to the public officially that the newly minted citizens are to be referred to as such while the military – and now the administration of Aung San Suu Kyi – continue to maintain the official stance that Rohingyas do not exist and they don’t really belong in Myanmar. It is the religious identity of Rohingyas which ultimately accounts for this sharp contrast in Myanmar’s official treatment of non-Muslim migrants from China or those from the Sino-Burmese borderlands and Rohingyas from the Burmese-Bangladesh borderlands. During the civil war of 1971 between West and East Pakistan (now Bangladesh), Pakistani General Tikka Khan (‘Butcher of Bengal’) orders to his troop: “I want the land not the people….”52 What befell on the fate of “the people”, unwanted on that wanted land of East Pakistan was left to the local commanders. In the midst of the two bouts of the horizontally organized violence – sectarian violence – in June and October 2012 during which Rohingya communities bore the overwhelming human costs, a decorated Burmese brigadier general who was stationed in Rakhine told the Burmese author pointedly, “What can we do, brother, they (Rohingyas) are too many? We can’t kill them all.”53 Indeed Myanmar military leaders, the architects and implementers of this religion-based demographic engineering, know they can’t kill all Rohingyas. But they certainly have resorted to various strategies of destruction of Rohingya community as an ethno-religious group. The most deplorable human conditions where life-essentials such as food and access to basic medicine are deprived or restricted are the direct outcome of central policies regarding Rohingyas.54 Indeed Myanmar’s exceptionally hostile treatment of Rohingyas as a group oscillate between acts of ethnic cleansing and slow genocide.55 How can it be otherwise when Rohingyas have been kept like “chickens in a vast cage”, awaiting their time of death and destruction, on land or in high sea, as a young Rohingya56 put it in a personal Facebook message to us, after he and a group of Rohingya IDPs met with the visiting UN Special Rapporteur Yanghee Lee on 12 July? Alas, a century after the perceived Indian threat to colonial Burma’s future – the “Indian Penetration” or “Indian Peril” – stirred the Buddhists’ imagination, post-independence Myanmar is engaged in the act of “transference”, this time targeting Rohingyas as caged chickens, potential agents of foreign “Jihadists”. The perceptions of threats – real or imagined – to a nation are raison d’être for all military institutions the world over. Based on popular, historical and official discourses about the people of India ancestry Myanmar’s most powerful institution – the military – has since 1966 framed Rohingyas as “a new threat to national security”. The colonial-era nationalist calls to pass laws “protecting Buddhist women” from Indian men, presumed abusive and predatory have also come to fruition: ex-General Thein Sein’s quasi-civilian government enacted four “National Race” laws, strictly controlling proposals for interfaith marriages between Buddhist women and Muslim men. With Communist threats fading into a non-concern at home with the collapse of the longest political party – the Communist Party of Burma – in 1989, the year of the Fall of Berlin Wall, and ethnic groups all having jettisoned their original aim of independence/secession from the Union of Myanmar, Myanmar military indeed needed a common enemy of the Buddhist nation. While the first persecution of Rohingyas began as a state-organized project of national security with its first large-scale campaign which drove out upwards of 270,000 Rohingyas into the neighbouring Bangladesh in February 1978 the military found it in its strategic interest to involve both the nationalist Rakhines in the region and the Buddhist public at large. This has enabled the military to steer the growing popular discourses of and demand for speedy and genuine democratization among the traditionally religious and anti-Muslim electorate. It forces the NLD party to move away from its push for Constitutional amendment to make Aung San Suu Kyi President and phase out the military’s hold on the parliaments at all levels. The increasingly Islamophobic Buddhist electorate is more concerned about “the imminent threat” from potential Jihadists than democracy and human rights none of which they have ever really tasted in their lives. It has for all intents and purposes nipped the Rakhine nationalist demand for greater revenue sharing from the central government-controlled lucrative gas and oil industry offshore from Rakhine coast line, as well as other multibillion dollar projects in Rakhine state. Rakhine population has become consumed by fear and loathing of Rohingyas whom in their view take Rakhine land and threaten Rakhine Buddhist way of life. What we call the “double-persecution” of Myanmar’s Muslims and Rohingyas has become a powerful unifying issue among the traditionally distrustful social forces in Burmese society: the ruling military, Suu Kyi’s NLD, the culturally revered Buddhist Order or monks and the Burmese intelligentsia and culture industry of movie-makers, artists, etc. For they all share this “global perception of the rise of Muslim power”, and the attendant fear and loathing of Muslims in and outside Myanmar. Aung San Suu Kyi, From Global Icon of Liberal Freedoms to Genocide Denier? Aung San Suu Kyi, typically sprinkles her essays and speeches with canonical Buddhist concepts and passages – such as loving kindness in her attempt to both explain her political views to the outside world and communicate with her domestic Buddhist electorates. Myanmar Armed Forces today, unlike the past, can boast of being Muslim-free. As a matter of fact, last year the serving Senior General Min Aung Hlaing, the Commander-in-Chief, has added58 the protection of Buddhism and “Buddhist Race” to the existing list of the military’s bounden national duties, besides prevention of the ‘disintegration of the Union of Myanmar’, maintaining the ‘territorial integrity’ and ‘peace and stability’ at home. With different and parallel reasons, Suu Kyi’s National League for Democracy party and its rival, the army-backed USDP have effectively emptied all political institutions out any Muslim citizens – regardless of how many centuries of lineage they have in the country. In our essay60 on the evolution of Rohingya persecution from the peaceful population control of an ethnic community who culturally and historically saddle the borderlands between the post-WWII nation-states of Bangladesh and Burma we have detailed how the initial concerns of cross-boundary fluid migration of Rohingyas has evolved regressively into a case where the Myanmar government is being credibly accused of ‘crimes against humanity’ ‘ethnic cleansing’ and/or even a ‘slow genocide’. Against this long post-independence history of the state’s direct involvement with Rohingya affairs, it is misleading to frame the plight of Rohingyas as the outcome primarily of ‘sectarian conflict’ between them and local Buddhist Rakhines. 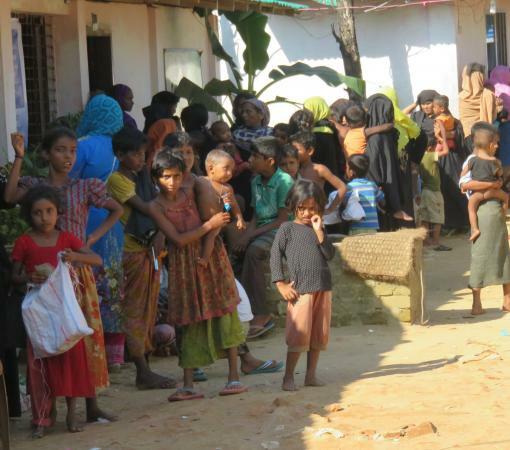 Rohingyas exist – not live – under human (or inhuman) conditions in Western coastal region ripe with chronic violence, “intentional deprivation”61 of food and basic medical services, all forms of freedom including physical movements, forced labour, sexual violence with state impunity, execution, extortions and false blanket accusations of “terrorism”62 – and all this is induced by policies made centrally by the successive Burmese military regimes, in Rangoon and since 2006 Naypyidaw. It is these deplorable conditions on land, coupled with chronic, large scale violence, mostly military-organized and at times communal, but with the security forces collaborating with groups of local militant Rakhines, which have forced hundreds of thousands of Rohingyas to flee their birthplace and homeland, both on foot across the land-border into Bangladesh and by boats to places as far flung as Canada and Australia, not just to Indonesia, Malaysia and Thailand. In our comprehensive study entitled “The Slow Burning Genocide of Myanmar’s Rohingya” which focuses on the history of Rohingya identity and presence, as well as the decades-long history of what we characterize as “the slow burning genocide” of Rohingyas, we have provided a detailed account of this persecution. It suffices here to note emphatically that Myanmar’s persecution of Rohingyas in Western Myanmar state of Rakhine and the sharp rise, again with the state’s blanket impunity, in hate speech and bouts of organized violence against the general Muslim population throughout Myanmar need to be seen on a continuum of strategic choices pursued by the military leaders out of their own institutional agendas, and informed by their own personal fear and loathing of Muslims. Given that Aung San Suu Kyi, who had, until recently, been seen worldwide as “the icon” of freedom and human rights placed in the same league with Gandhi, Mandela and King, proved capable of cleansing her parliament and government of her fellow country people whose only “sin” is they are Muslims, it is no longer a dismissible conspiracy theory to argue that Myanmar’s most powerful institution, the Tatmadaw, and the Suu Kyi’s elected government are both playing the ‘race-and-faith’ card at the expense of the country’s Muslims and committing a systematic, and sustained persecution against Rohingyas. Heavily swayed by the military’s manufactured propaganda regarding both scapegoated Muslim communities, the public itself has come to view the latter as two integral components of a single Common Threat to the nation. If indeed Buddhist Myanmar is united in this two-fold crime against these two populations because of their religious and ethnic identity then the prospects of Myanmar seeking or finding homegrown solutions – without external interventions – are non-existent. But, on the other hand, given that there is zero appetite on the part of the world powers, or political will, coherence or even capacity within the global governing institutions the future of these two religious and minority communities looks incredibly bleak. After nearly 30-years since their Great Uprisings of 8.8.88 (8 August 1988), the majority Buddhist people of Myanmar have not enjoyed genuine freedoms or democracy or human rights, despite Aung San Suu Kyi, playing the respectable façade of the current transition. When the oppressed majority themselves fall prey to the military’s systematic mobilization and partake in everyday acts of injustice and systemic repression of their fellow country-men and women such as Muslims and Rohingya, then they end up undermining their own ultimate struggle for freedom, and their collective humanity. This may well prove to be the greatest act of self-harm the patriotic Burmese are doing to the future of their beloved country.